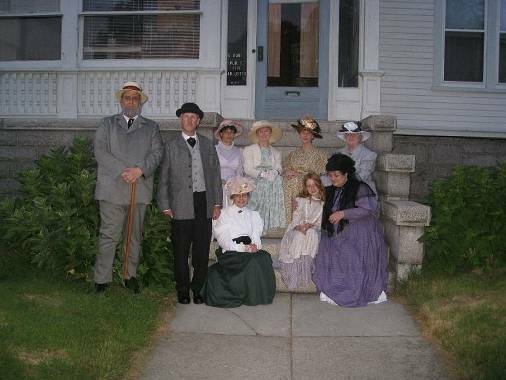 Over the years the Second Street Irregulars and the Pear Essential Players have been fortunate to be able to visit Maplecroft on many occasions, either individually or as a group. Photos allowed to be taken of the interiors were promised to be viewed privately until such time as the owner sold the house. Now these may be shared. The most remarkable feature about Maplecroft is the wood – floors, paneling and woodwork, especially the fireplace mantels. The stonework in Lizzie’s hearth in the back bedroom over the porch and the big stone chimney are memorable. It was very exciting to see her own dining room wall paper choice and the tin ceiling in the kitchen. Here is a sampling of the interiors and exteriors, from the entry to the third floor. It was thrilling to see the window seat in the front second floor room and imagine Lizzie watching out. Link to photo album below.